At the end of last year, we brought holiday cards to our local Public Safety Complex to thank them for their hard work each year. In particular, my older son (then almost 4) had been talking about the firemen and the policemen ever since he saw them at work in our town after the October 2011 blizzard. 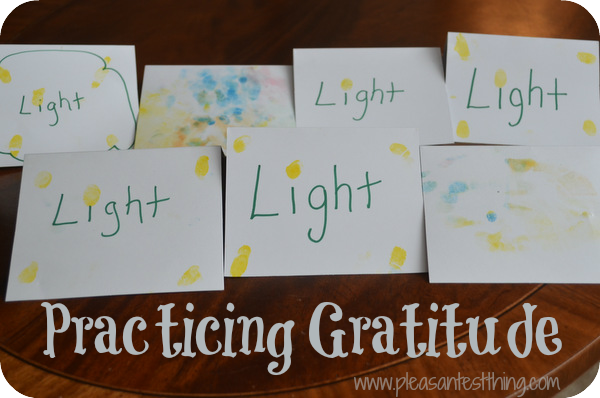 When I joined Inspired by Family‘s 21 Days of Gratitude, I knew I would want to carry on this tradition. We created cards to bring to the various departments who worked tirelessly to get our town back into order after Hurricane Sandy. They were up until hours, out in the cold, working round the clock. There were massive trees down on houses, power lines, and across roads. One town worker told me that over 300 utility poles in our town alone were knocked down. Train service is still not restored. These public servants set up warming and charging stations, got out critical information, cleared hazards, and cleaned up debris. They are truly deserving of our gratitude. Because the lack of light was what made the biggest impression on my kids, we decided to make that the theme for our cards. 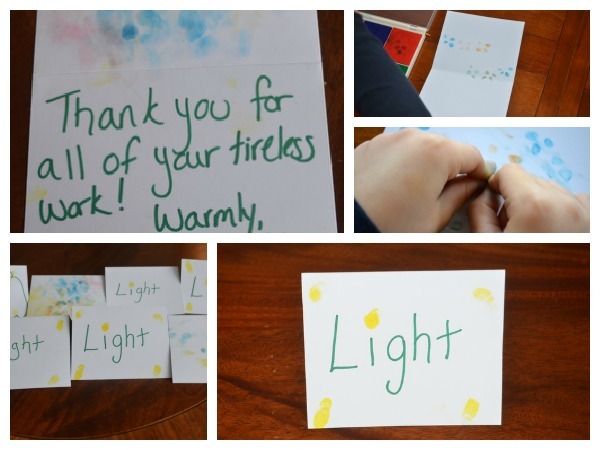 I wrote “Light” on the front, using a yellow stamp pad, they added a fingerprint to dot the i. Both of my boys then had some fun decorating the rest of the cards with fingerprints. We made cards for the Police Department, Fire Department, Mayor and his council, Electric Utility, Public Works Department, and the Office of Emergency Management. They went above and beyond for the town, and we are so grateful. There were also several out of town electricity crews who came to help, and we made cards to mail to them. We went to the Public Safety Complex to deliver our cards, and add a personal thank you to our note. My older son hung behind me when we walked in, but by the end of our visit, he was giving out high-fives and smiling. Bringing my son to deliver the cards, and see the people who helped us made an impact on him. He connected the people who helped us to the help we received, and, I believe, understood gratitude. The visit and the cards were such a success that they will be an annual tradition for us (hopefully next year we will not have to thank them for helping us through days and days of no power, however! ).